Last week, when most of the people I knew were engaged in the great Australian bake-off of Anzac Biscuits for Anzac Day, I decided to swim against the tide and bake some Damascus cookies. Many years ago, I used to work in a café in Melbourne and we sold massive amounts of a house-made version of these cookies. 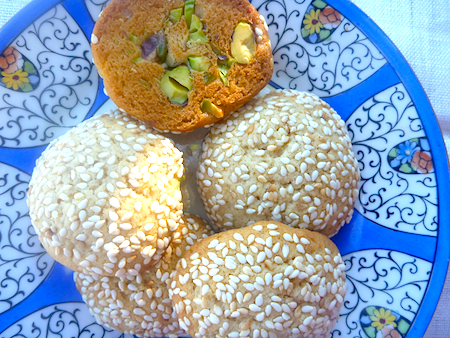 The Arabic name for these biscuits is barazek and they are popular throughout Lebanon and Syria. There are a lot of commercially-made barazek out there and they tend to be both larger and flatter than this homemade version. Try as I could, and despite the accompanying recipe book picture of a much flatter cookie, my version came out quite domed. This didn’t affect the taste; in fact, they were even more delicious than I remembered them. I made these on the Thursday and they were such a hit with my family that I made another batch the next day to take to my nephew’s wife who was in hospital with her first baby. 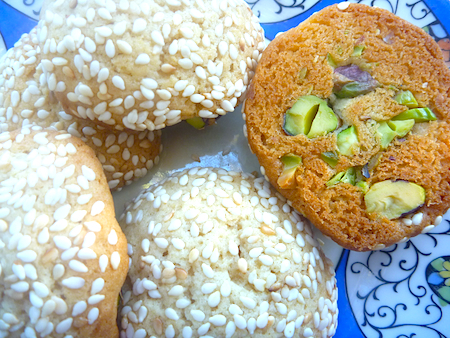 With the wholesome combination of sesame seeds, pistachios and a not overly sweet dough, they seemed like a very healthy offering for a new nursing mother. Be warned – these cookies are dangerously addictive, before you know it, you’ve eaten three or four – and you’ll need to keep on baking and baking to keep up with demand. Combine sugars and beat with butter until creamy. Add vanilla extract, then egg and then add flour. This is a very soft dough, so wrap in cling wrap and let sit in fridge for an hour before baking. Preheat oven to 180°C (350°F) and grease or line two baking sheets with paper. Roll small pieces of dough (about the size of a large marble) into balls. Flatten the dough and press firstly into the pistachio slivers, then press the other side into sesame seeds. Place on trays about 5cm (2 inches) apart and bake for 10–12 minutes until golden. These are definitely addictive – you can have about 5 or 6 without realising it, and constantly be on the lookout for more! A top biscuit. 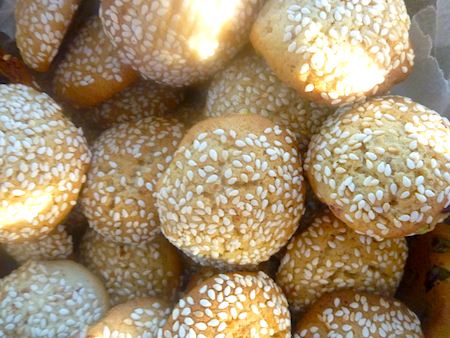 Delicious and highly addictive biscuits. Very much appreciated in the hospital! Hi! I really love this post and your blog!!!!! These look delicious! I’ve never made biscuits with pistachios in them before but I think I’ll have to give these a try!